It is now increasingly evident that Russia’s population has settled on a small but decidedly firm upwards growth trend. I have been vindicated. According to the latest data, in the first eight months of the year births fell by 1.4% (12.5/1000 to 12.3/1000) and deaths fell by 6.2% (from 14.6/1000 to 13.7/1000) relative to the same period last year. 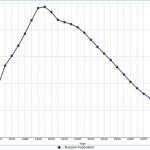 The rate of natural population decrease eased from -198,3000 to -128,800. The big fall in the death rate is due to two factors: (1) the continuing secular increase in life expectancy, due to decreasing alcohol consumption and more healthcare spending; (2) specific to 2011, the “high base” effect of the mortality spike during the Great Russian Heatwave last year. This natural decrease was more than compensated for by 200,255 net migrants during the same period, making for a population increase of 71,500 this year to August. This more than cancels out the population decrease of 48,300 for the whole of 2010, and let it be reminded that it rose by 23,300 in 2009. 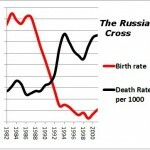 In other words, in stark contrast to the avalanche of doom-mongering articles that continue to be written in the Western press about “dying Russia” – of which two of the most egregious examples are this and this – the reality is that today in net terms Russia’s population is now larger than it was in 2009. At this point an important methodological point has to be made. This year, Rosstat switched to only accounting for immigrants who “register at the place of residence” in their population updates, as opposed to the previous method of accounting for anyone who enters the country with a permit to stay for a year or more. The former number is much smaller than the latter: whereas there were the aforementioned 200,255 net immigrants by the old method, Rosstat’s registration method only shows 68,822 (with the result that Rosstat says that Russia’s population actually decreased by 60,000 in the first eight months of this year). However, as Sergey Slobodyan (a frequent guest blogger here) noted at the JRL, this was an opaque and rather bizarre switch. For a start, even using the first method in the years before 2011, which gives far more emigrants than the by residency method, Rosstat still under-counted the numbers of migrants in Russia by one million – the 2010 Census showed there to be 142.9 million Russians, as opposed to the 142.0 million estimated by Rosstat on the basis of projections from the 2002 Census. And even on an intuitive level, doesn’t it seem obvious that far from every migrant to Russia will immediately bother (or be able to afford!) registering at a place of residence? Slobodyan speculates that the reason the new methodology was adopted was because of nationalist tensions over immigration levels in the run-up to the upcoming elections, which may have pressed the Kremlin into pressuring Rosstat, at least for the time being, into purposefully under-counting immigrants; hence the unexplained switch in methodology. Particularly encouraging in the statistics for this year is that “mortality from vices” continues to fall very rapidly – things such as homicides, suicides, poisonings, etc., that have a much higher than average negative impact on life expectancy (because people who die those deaths tend to be younger) and the social problems they are typically associated with. Note that all of these figures are already lower than in 1990, the last year of Soviet normality (more or less). The same trend can be seen for deaths from accidents. Now to be accurate these death rates are still very high by global standards: whereas Russia’s total numbers of deaths from “external causes” (suicides, homicides, accidents, etc.) was 134 / 100,000, thus dipping below the levels of 1990, it is still far from the 40 / 100,000 types of figures in countries like Australia. No-one doubts that there is still a lot of work to be done on the health and safety front. Predictably, none of this gets mentioned in the Western media, which is still replete with tropes about the mass emigration of Russia’s middle classes (debunked here multiple times), non-existent population collapse, and citations of outdated CIA World Factbook figures which are cited in lieu of official Rosstat ones. To the contrary, the population has stabilized, and the “brain drain” is now a mere trickle (only 400 Russian R&D specialists emigrated abroad for an undefined amount of time in the first half of 2011, which is a drop in the ocean besides its population of 143 million). Meanwhile, they have missed the true demographic apocalypse that is occurring not in Russia itself, but in one of its neighbors, Latvia, long lauded as a pro-Western and economically liberal “Baltic tiger”: almost as many people are now leaving Latvia every year as leaving Russia. But Latvia’s population is 75 times lower! Now the big demographics agencies are recognizing that things have fundamentally turned around. For instance, in its most recent 2011 World Population Data Sheet, the PRB’s Medium forecast for Russia’s population in 2025 is now 139.0 million. In the 2010 Revision of the World Population Prospects by the UN Population Division has Russia’s population falling to 139.0mn in 2025, with the High forecast being 144.5mn in 2025. Russian statistics agency Rosstat forecasts 140.9 million in 2025, the High version being 146.7 million (note that they still use the base population of 142.0 million for this estimate, not the 142.9 million revealed by the recent Census; in reality, once this is accounted for, their 2025 would logically be by a million bigger). Whither now? I believe the current Low scenarios, envisaging a drop to the low 130 millions by 2025, have become very unlikely – they assume that many of the trends we see today, such as falling mortality, and net emigration, almost completely stall. 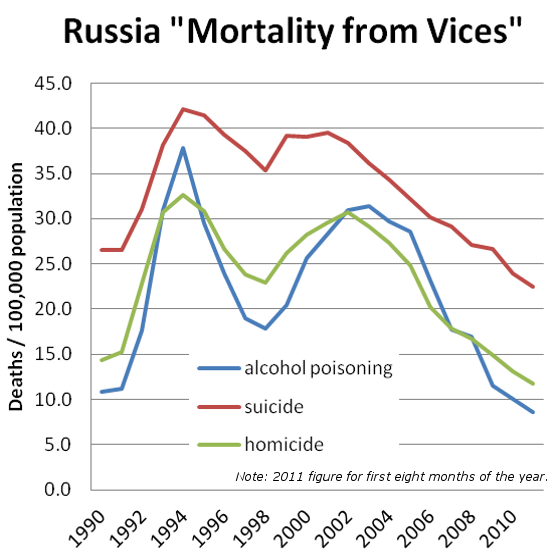 In the light of the government’s campaign against excessive alcohol drinking – the primary cause of Russia’s high mortality rates – and the historical successes that tend to accompany such campaigns (e.g. Karelian Finland in the 1970’s and 1980’s), not to mention the more recent Baltic experience; as well as continued economic growth that will enable more resources to be diverted to healthcare and for consumers to pursue healthier lifestyle choices; means that life expectancy will continue rising relatively quickly. Meanwhile, as long as there remains a substantial income gap between Russia and the Caucasus and Central Asia, immigrants will continue to come. Some commentators have argued that fertility convergence in those regions will reduce the number of potential migrants to Russia in the years to come. Perhaps. On the other hand, as Moldova and the Baltic nations show, even being in demographic straits of their own does not necessarily lead to diminishing supplies of emigrants from economically-behind countries. 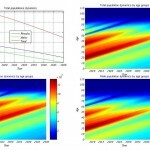 The above graph is a set of Low, Medium and High projections from Rosstat in 2000, with the High version (green) being a stabilization at 142.7 million people in 2011. As one can see, the mere fact that Russia’s population is at 142.9 million is a surprise to the upside as viewed from a decade ago. If things go well – the economy continues growing, mortality rates keep falling, etc. – then it is entirely possible that Russia’s population will follow today’s mainstream High projections (144-147 million) or even surpass 150 million (as in my original High projection) by 2025. EDIT: This article has been translated into Russian at Inosmi.ru (Российская демография: развенчивая мифы).